The only loss by junior defensive end Ngalu Tapa (6-3, 260) and the Luther Burbank Titans took place in the CIF Sac-Joaquin Section Division I semifinals. Tapa returns next season after getting in on an amazing 23.5 sacks. James Logan of Union City, Pittsburg and Ripon gain positions at the end. Every division features expanded pecking order plus teams to watch for the 2013 season. Expanded Next Five Teams: 16. Buhach Colony (Atwater) 10-3; 17. Downey (Modesto) 10-2; 18. St. Mary’s (Stockton) 9-3; 19. Grant (Sacramento) 5-6; 20. Lincoln (Stockton) 8-4. Honorable Mention: Amador Valley (Pleasanton) 8-5, Archbishop Mitty (San Jose) 8-4, Oak Grove (San Jose) 10-1, Palma (Salinas) 8-3, Palo Alto 8-3, Pleasant Grove (Elk Grove) 7-5, San Ramon Valley (Danville) 6-6, Stagg (Stockton) 9-2. Teams to Watch in 2013: De La Salle (even if Bob Ladouceur retires as head coach the cupboard will hardly be bare); Folsom (most starters will be back); Granite Bay (first game will be against Folsom); Bellarmine (top-rated QB returning); Stockton St. Mary’s (very good underclass players with even more coming up from lower levels). 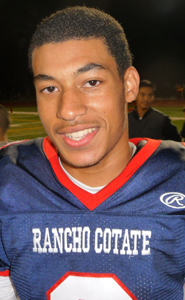 One of the top ninth-grade players in Northern California was receiver/safety Chris Taylor-Yamanoha from 12-1 Rancho Cotate of Rohnert Park. Expanded Next Five Teams: 11. Concord 10-3; 12. Paradise 8-4; 13. San Benito (Hollister) 8-5; 14. Los Gatos 8-5; 15. Sierra (Manteca) 10-2. Honorable Mention: Casa Grande (Petaluma) 7-4, Chico 8-4, El Camino (Sacramento) 8-4, Foothill (Palo Cedro) 8-4, Lincoln (San Francisco) 9-1*, Newark Memorial (Newark) 9-3, Wilcox (Santa Clara) 8-5. *Record does not include two default wins. Teams to Watch in 2013: Oakdale (new bowl format suits program well); Clayton Valley (second year for coach Tim Murphy might not be much different than first); Vista del Lago (squad loaded with top underclassmen). Expanded Next Five Teams: 11. Los Banos 11-2; 12. Campolindo (Moraga) 10-2; 13. Menlo School (Atherton) 10-3; 14. Seaside 11-1; 15. Center (Antelope) 10-3. Honorable Mention: Arcata 11-2, Aptos 10-3, Argonaut (Jackson) 11-1, Carmel 9-2, Justin-Siena (Napa) 11-2, San Marin (Novato) 7-7, Sobrato (Morgan Hill) 8-4, Soquel 9-3, West Valley (Cottonwood) 11-2. Teams to Watch in 2013: El Cerrito (forget D3 this team with Jalen Harvey, Keilan Benjamin, Marquis Pippins, etc. will be one of NorCal’s best period); Menlo School (QB had 34 TD passes as junior); Marin Catholic (Andrew Celis among those back); Carmel (Soph. QB, Jr. RB, Jr. WR combo should be prolific). *Indicates one default win not included. Expanded Next Five Teams: 11. Willows 9-4; 12. Pierce (Arbuckle) 11-1, 13. Foresthill 10-2; 14. Ripon Christian 9-3; 15. Hamilton (Hamilton City) 9-4. Honorable Mention: Bradshaw Christian (Sacramento) 5-6, Chester 9-2*, Maxwell 8-3, Pierce (Arbuckle) 11-1, St. Bernard’s (Eureka) 7-5, Tomales 6-5. *Default win not included. Teams to Watch in 2013: Central Catholic (Raiders will always be factor in current bowl format); Le Grand (Ryan Martinez and Dustin Slate should form strong backfield); Ferndale (hope team continues to stay in NCS D5). Central Catholic’s starting QB, RBs (2), top 3 WRs, top defenders are graduating.CC’s graduating only 15 seniors on a 45-man roster, but those 15 were great. CC does have it’s best lineman returning. But they’re in an extremely tough division. I don’t think they’ll have a run like they did this year. Oakdale will be graduating most of its starting lineup. The Mustangs should still be a Sac-Joaquin Section Division III playoff team next year, but not sure how far they will go. The 2014 team has the potential to be even better than the 2012 team. Sutter has a sophomore group that is 20-0 since being in high school. Couple that with a strong junior class and the Huskies will be in the thick of things for years to come. Thanks for recognizing our kid, Chris Taylor-Yamanoha. He had a phenomenal season as a freshman, particularly at CB (not safety)..He locked it down all season. We appreciate the nod…3 more years!!! GO COUGARS!! !